Last year, when Manton Reece of Riverfold Software, maker of Tweet Library, announced he was working on a new service to sync Twitter timelines across apps and platforms called Tweetmarks, Twitter users and iOS nerds alike rejoiced, and began hoping the service would work as well as Manton promised. Not only did it work, Tweet Marker -- the final name of Tweetmarks -- turned out to become the de facto solution to implement synchronization for timelines across different Twitter applications. In the past nine months, we have seen Tweet Marker find its way into popular apps like The Iconfactory's Twitterrific and Tweetbot, spanning a variety of mobile devices and platforms like iOS, the web, and even Android. Today, Reece is launching Tweet Marker Plus, an enhanced and paid version of Tweet Marker that adds new features on top of standard timeline sync. At $2 per month, Tweet Marker Plus offers new functionalities and a web interface for Twitter users, while keeping the basic sync you may already be using in Tweetbot or Twitterrific completely free. On top of that, developers who are already integrating with the "regular" Tweet Marker can now also check out version 2.0 of the API, a minor upgrade to improve reliability. Tweet Marker Plus brings a web-based timeline that remembers the read position from Tweet Marker-enabled apps; a searchable archive of your tweets and tweets from people you follow, and an option to manually select the tweet you want to sync with other apps. I have been able to test Tweet Marker Plus prior to its public launch, and I've been consistently impressed with the sync implementation that seamlessly switches from the web, to clients on the Mac and iOS. The most visible feature of Plus, the web timeline, is very straightforward, but I believe it'll prove to be a worthy addition for, say, those users who rely on iOS and Mac apps at home, but who are forced to stay on Windows environments at work. Tweet Marker's web timeline can pick up from where you last left off on another connected client, and it's got a "scroll to marker" option to manually load your last-seen tweet. On the timeline itself you can reply, retweet, mark as favorite and check out a tweet's unique URL, but these actions will simply forward you to a dedicated page on Twitter.com. Tweet Marker's Plus timeline isn't meant to be a full-featured client: rather, it is a basic way to rely on your existing sync position if nothing else is available. At the core of Tweet Marker Plus there's the new search option, which will keep a searchable archive of tweets from you and the people you follow. This is something I've been obsessed with lately -- to be able to keep a fully indexed archive of tweets I saw appearing on my timeline on any given day. I have been using a combination of Greplin and CloudMagic to search for old tweets from my timeline, and it looks like Tweet Marker Plus will be a fantastic addition to this category of services. Reece told me the goal is to begin by keeping an archive of about a month of tweets, indexing 800 tweets (per Twitter's limits) when a user signs up to the service. As more tweets are scanned and indexed in the background at regular intervals, Reece plans to increase the amount of tweets searchable by Tweet Marker as the service grows and evolves. 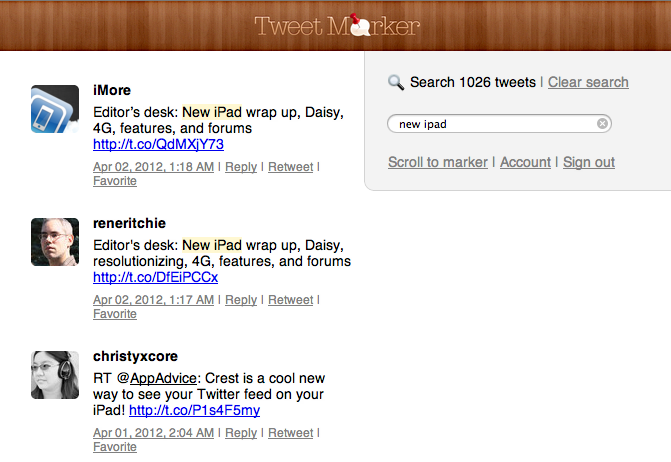 With over 170,000 users to date and 1,000 new ones added each day, Tweet Marker is now a reality that is not going away anytime soon. Twitter hasn't shown any particular interest in allowing users to sync their timeline position through apps and platforms, and Tweet Marker has turned out to be the proverbial "right idea at the right time" as users were growing tired of having to manually reload and scroll timelines in their clients of choice. Tweet Marker's servers now process over 40 million hits a week, and the service has been enabled in 15 different apps across 6 platforms. The idea for Tweet Marker Plus, Reece explained, is to lay the foundation for an improved service that will give subscribers more features inside supported apps while continuing to work with the free version, which doesn't require any registration or subscription. It may be a version 1.0, but Tweet Marker Plus is already a solid offering. At $2 per month, the service adds search and a web-based interface on top of a platform that has reliably synced Twitter timelines on a variety of apps and hardware. You can subscribe to Tweet Marker Plus here.